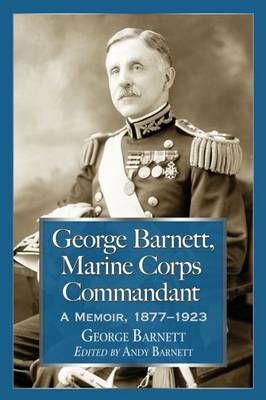 George Barnett was the man behind the United States Marine Corps' transformation from an antiquated afterthought to a modern force with an international reputation. After a long apprenticeship as a junior officer, Barnett emerged as a pioneer of amphibious warfare. Leading the experimental Advanced Base Force Brigade at Culebra in 1914, he secured the Corps' survival by establishing its new, amphibious mission. Appointed Commandant the same year, Barnett organized the Corps for service in Europe, agitated for its expansion and overcame opposition from the Army and Navy. Without him, the Marines would not have served in France in the World War I.
Barnett was abruptly relieved as Commandant in 1920, in what has been called "the Barnett Putsch". In retirement, he dictated his recollections of 45 years of service, including his education at Annapolis, overseas service in Sitka, Samoa and Peking, and encounters with Robert Louis Stevenson, the Meiji Emperor and the Dowager Empress of China. This edited version of his story provides an unprecedented look at the Corps between the Civil War and the Spanish-American War. Long mined by scholars, Barnett's memoir is now available to the public.